Completing a challenging internship is highly empowering. Although the first few days can be overwhelming, with the right mindset you’ll quickly realize how much you already know, and you’ll be able to focus on improving your speed and learning the techniques used in the particular kitchen you’ve chosen for your internship. The most satisfying internships take place in kitchens where you’re allowed to do more than chop. Of course, every intern should expect plenty of prep work, but some chefs allow you to work at various stations during the course of your time there. For example, at Mercer Kitchen, many students have reported getting on the line during their first few days – under close supervision, of course. But their philosophy is that students learn best by doing, not just watching. There’s no better confidence builder than completing an intimidating task successfully and realizing you have the skills necessary to do the work required in a busy restaurant kitchen. Most students who go to Mercer spend 2 days on every station in addition to lots of prep work. Other positive feedback comes from farm-to-table favorites like Savoy, Il Buco, Mas Farmhouse, Gramercy Tavern and both Blue Hill restaurants (Stone Barns and NYC locations). All place an emphasis on local, seasonal ingredients, and students describe the kitchen staff members as driven, dedicated, creative, and most importantly, very supportive when it comes to interns. That makes for a very positive learning experience. Interns at these establishments spend much of their time at the garde manger station, but often get a chance to plate, make pastry, and do lots of prep. 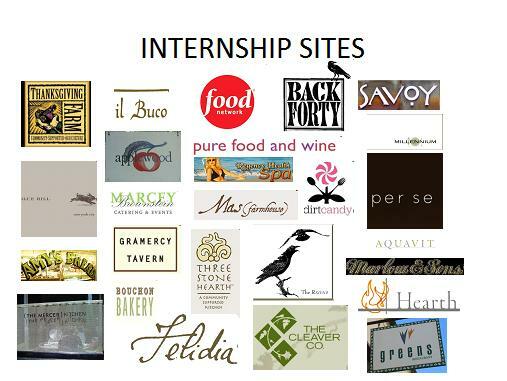 For exemplary students who can commit to a 3-month, formal internship with a full kitchen rotation, there’s Per Se. This is strictly for the highly motivated. It’s difficult and physically demanding. The schedule is 5 days per week, and the shifts are 12 to 14 hours long. As one student put it, “It taught me a lot about myself…and what it takes to be great…what dedication and passion for cooking mean.” The application/acceptance process is sometimes lengthy, and there’s often a waiting list, so plan ahead. For students who prefer to spend their internship hours in a plant-based environment, Dirt Candy and Pure Food and Wine top the list in this category. At Dirt Candy, interns can expect to make soups, sauces, and desserts in addition to prep work and plating. All report back that they get excellent hands-on experience in this tiny but exceptional kitchen. Pure Food and Wine allows students to explore the techniques involved in upscale, raw food preparation. In this kitchen, the chefs are all good teachers, and the atmosphere is calm, focused and team-oriented. If you wish to venture outside of New York City, internships at Berkeley’s Three Stone Hearth get rave reviews. It’s a community-supported kitchen where students are actively involved in preparing soups, stews, savory dishes, baked goods, condiments, cultured products and other nutrient-dense foods. The partners (two of them are NGI grads) work directly with local farmers. A recent intern wrote, “This is an amazing place to intern – so supportive, and you learn so much. I could not have been happier with my experience!” Three Stone Hearth also has an Apprenticeship Program for those who wish to make a longer commitment. The thing to keep in mind is the purpose of the internship: to put your newly acquired skills to use, continue the learning process and gain confidence. There are many, many venues in which to do this. These are just a few of our particularly noteworthy options. What a timely and appropriate piece! As a Natural Gourmet student currently contemplating and sifting through the myriad of possibilities for interning I really appreciate this artile. Definitely a keeper! Thank you! This is great Rosemary, thank you! I just came across this blog and thought it was equally timely, especially for any of us who aspire to be restaurant chefs.